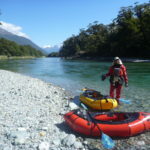 The Hollyford-Pyke loop is one of NZ’s classic packrafting trips. The trips takes you through rivers, lakes, lagoons, estuaries, along wild west coat beaches, lowland scrub and lush beech forest. Seemingly defying gravity, there’s only 2.5 days walking out of 6, and that walking hardly climbs more than a few hundred meters. It’s a chance to visit some relatively remote parts of south-westland, and if the weather’s good, you’ll have spectacular views of the incredibly rugged Darran Mountains. 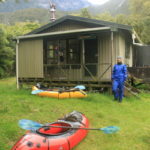 Plenty of huts on the famous Hollyford track make it easy to wait out any bad weather and escape from the sandflies. They also provide lots of options to chunk the trip into smaller days. With the lack of track maintenance in the Pyke valley, very few folks venture up that way by foot; Packraft is indeed the weapon of choice to explore that area. The paddling itself if more like sea kayaking than white water, with the main river hazard being log jams in class I-II water. Some require a bit of manuoevering to avoid, so whilst its not a difficult whitewater paddle, packrafters need to be able to confidently move and make lines to avoid the obvious hazards. Nothing hazardous is mandatory, almost every section with current could be portaged. The description below breaks the trip down into recommended days though you could easily spend more time if you wanted to. 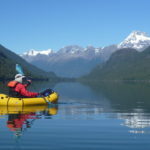 Infact having a day or two up your sleeve for adverse weather is a good option, as some sections (such as Lake McKerrow) required good conditions to be able to paddle. The walking alternative would be much slower. Same goes for the Pyke Valley. Rain storms can make this river rise by meters, flooding tracks and potentially making the river hazardous. This is a wet and wild part of the world, so pick your weather carefully and factor delays into your plan. 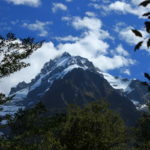 Check out the Hollyford Valley area page on the DOC website for more information about huts, hut fees, Hollyford Track notes, Pyke-Big Bay track notes and other short walks in the area. The information about the huts has GPS coordinates, which are worth having if you’re bringing a GPS. Wind and tides influence travel on the lake, esturary and coastal parts of the route, so its worth doing your home work on these before you go. The closest tide table location is Jackson’s Bay (north east of here) which is well worth printing out and bringing on your trip. Since you are floating for the first part of the trip, its well worth bringing gourmet food and drink. Seems to make all the hut occupants want to take up packrafting…. 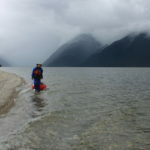 Its probably best to think of the paddling as ‘sea kayaking’ rather than white water when it comes to paddle gear selection. We didn’t take helmets, and didn’t feel they would have been nessecary. Barely saw a handful of boulders in the rivers the whole trip. A throw bag is well worth having, as the number of tree’s in the river mean that some way of rescuing someone on a tree is well worth it. The river is quite wide in places 30+ meters so consider the weight vs range of your throw bag. Although we never felt like we were at any risk of capsize, I still recommend good cold water protection. The water is pretty cold, and out on those big lakes you can feel quite exposed. Also heavy rain is more likely than capsize… We wore drysuits and felt comfy the whole time. A GPS is probably a good thing to have for the section between Big bay Hut and the Pyke River. Here, the track meanders a lot, and is poorly formed and sparsely marked. You’re in the forest the whole time, so its tricky to orientate yourself. Loosing the track wouldn’t be the end of the world, but it would be very time consuming trying to bash through to the east. Better would be re-tracing your steps via GPS then re-intercepting the track. If you like fishing, get yourself a licence and take a collapseable spin fishing set up. The rivers are quite big, deep and somewhat featureless from a fishing point of view, so spin gear covers lots of water when blind fishing. 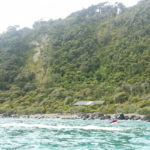 You can also troll from your packraft as you paddle the lakes, contouring the drop off might take you a little longer, but also might help shelter you from the wind if its there..
Martins Bay Hut and Big Bay might offer some sea fishing opportunities, but probably not ones that you can effectively do with anything less than a decent surfcasting rod. 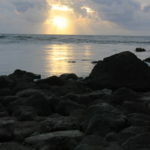 The ocean is generally very rough and the shore quite rocky (not in a good way for fishing). We did find it easy to get a feed of muscles at dead low tide from the rocks around Big Bay. Don’t forget your insect head net and some bug reppellant. Sitting outside without these is an exercise in tolerance that won’t last long without those bits of kit. There was usually plenty of side streams along the way, so a small Nalgene as a mug and waterbottle works well. 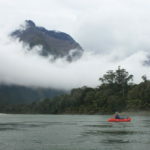 The Hollyford Rd end is about 2hrs from Te Anau, which is the best place to stock up on fuel/food. Gunn’s Camp (about 8km before the road end) provides a place to stay before/after your trip as well as last minute food or fuel. 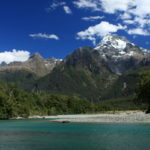 Whilst the upper Hollyford includes some very hard kayaking runs, below the road end the river is a very different proposition. Its reasonably big volume class I, with the occasional little wave train that might just make class II, virtually all of which can be easily portaged. 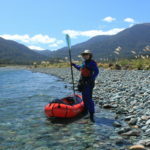 There are plenty of long slow sections, where you can paddle along, or just lay back and enjoy the incredible views of major summits of the Darran Mountains, such as Madeline and Tutoko. 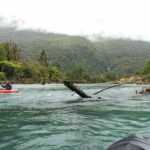 The greatest hazard of the middle Hollyford is logs. The frequent floods in the area have sprawled the river with huge numbers of trees. Most rapids have a few in them, and some have enough that you almost need to scout the line through the wood. Indeed, a few times we needed to catch an eddy behind one tree in order to make the move to get through the gap below. So even though its basically class I water, you need decent class II skills to be safe. Its about 2hrs from the road end to Hidden Falls Hut (12 Bunks, serviced hut). The hut isn’t visible from the river, but if you take out immeadiately after the confluence of Hidden Falls creek, and scramble up the scrubby bank to the flats to the east, you’ll be able to see it then. There are a few trails through the grassy flats to the hut. The hut looks large, but about half of the volume is wardens quarters! The Little Homer rapids (class III+) are just after glacier creek enters on the true left. They are very easy to spot: huge boulders start to appear on the horizon and you can easily hear the rapid. The jet boat portage is on the true right, immediately above the boulders. If you’re paddlin near the true right bank, its easy to find. Jetboaters winch their boats through the forest, through a muddy, uneven ‘track’, that will take you 10-20mins to carry your boats along. Its not possible to portage the whole Little Homer Rapid on the river bank, so most folk will follow the track. Apart from one notable class II wave train just above McKerrow Island, the rest of the middle Hollyford is the same as the first section. 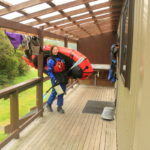 Its about 4 hrs from Little Homer Rapid to McKerrow Island Hut. McKerrow Island Hut (12 bunks, standard, fireplace, mattresses) is just inside the bush edge as shown on the map. There are little informal tracks from the true right of the river, directly to the hut, but they are a little harder to find from the river (easy from the hut). 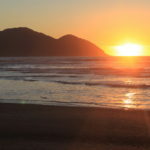 Cutting the corner of the sandspit and walking on south on the beach, you’ll soon discover a big orange triangle which indicates the short path to the hut. This was a great place to stay, lots of character! This day is the technical and physical crux of the trip. The wind is the primary factor effecting this section, followed closely by the tides in the lower Hollyford estuary. If there’s any strong wind or whitecaps on the lake, don’t even bother. 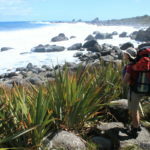 Its better to wait for a day, or start the 10-12hr walk to Martins Bay. Unless there’s a strong wind forcast, generally an up valley sea breeze will develop over the course of the day. 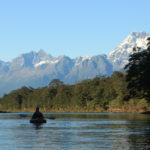 The standard tactic is to wake up very early (like a few hours before sunrise) so that you are on the water at first light (sunrise minus about an hour). This allows you to get as much paddling done before the sea breeze kicks in. Demon Trail Hut is easy to spot from the lake, as it sits on a bluff about 10m above the lake. It appears that there’s a beach to land at just south of the hut, where you could probably bush bash up to intersect the track, though we didn’t check this. Hokuri Hut is not visible from the Lake, but if you’re following the map carefully, you should be able to spot the DOC signs on a beach just below the hut. These indicate a short track up to the hut. The hut location isn’t that great; in the forest without any view nearby and far enough from the lake to be an effort to carry your boats, so I wouldn’t suggest planning to stay there. 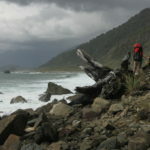 Beyond Hokuri Creek, the Hollyford track goes along a gravel beach. By this stage the wind had come up for us, so we got out and walked the shoreline dragging our rafts by our throw bags. Was probably about the same speed, but much less effort and used different muscles! There are a few orange triangles where the track heads inland. This is a key decision point: Paddle the estuary, or walk the track. If there’s a headwind, or the tide is incoming, I’d suggest the track (3-4hrs walk) even if it is hard work. The tidal surge heads a long way up the estuary, so even if it past high tide, the water might be still heading up valley. Conversely, at mid tide, when flowing out with maximum velocity, it can be very swift at Martins Bay Hut, posing a risk to anyone falling out. At Martins Bay Hut, the landing can vary markedly with the tide, wind and swell. It’s a rough rocky shore, so not the place to land when the water is moving around a lot. There are better options a little inland, but you have to bash through thick scrub to get to the (obvious) track. I’ve heard trip times of 5-10 hours for this paddle section, so do your homework on the tides, winds and get an early start! Well worth factoring in a spare day if you had to wait out weather, or break the section into chunks using Hokuri or Demon Trail Huts. Martins Bay Hut (24 bunks, serviced, heating) is in a great location, with a seal colony a few minutes walk along the track. Definitely a great place to watch the sunset through the surf! The track begins well from Martins Bay Hut to the Long Reef Seal colony, but then rapidly deteriorates from there. Its overgrown, sparsely marked, and barely formed in the middle sections. We were able to follow long sections of it with difficulty, but lost the ‘track’ on several occaisons and then stumbled back upon it as we bush bashed onwards. The track eventually arrives at the beach, where the going is much easier. Many reports talk about simply following the coast for this section, but we were there at high tide in big swells and it didn’t look safe. Also lots of Seals around, so keep an eye out if you head that way! Travel along the shore is pretty good from then on. Orange triangles mark the track across penguin rock as marked on the map, which is worth using. East of the private hunters houses, there is an old bulldozed track which is much faster travel than the gravel beach. Its easy to cross the McKenzie River mouth at low tide, both Martins Bay and Big Bay huts have little warning notes about the shifting gravel danger of crossing the McKenzie.. There are options further up valley, but you’ll get pretty wet if you don’t use your packraft. There are plenty of side streams for drinking water until Three Mile Beach. 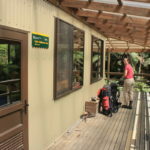 About 5 hours from Martins Bay, you’ll reach Big Bay Hut (9 bunks). It isn’t visible from the beach: you need to be at the high tide mark to spot the DOC sign that shows the trail to the hut. There are lots of private whitebaiters huts in this area: remember to respect private property. Big Bay Hut is a great hut, with plenty of character, set back from the beach and unfortunately without any views. It’s a reasonably full day through to Olivine Hut, but if you can time your start to be within an hour of low tide then you’ll save yourself some time. To access the start of the Pyke track via the swing bridge takes about 45 muddy mins, but going direct across the river mouth, north of the hut is on via grassy tracks and takes about 15 mins. The Pyke Track is quad bike size track, which is pretty easy to follow right up to the Dry Awarua River. There are also plenty of side streams for water on this section. East of the Dry Awarua, the track becomes less well marked, more overgrown and meanders a lot. A GPS would be worth having in this section incase you loose the track. There isn’t any more drinking water till the Pyke. The final part of the track heads down a dry river bed. About 3hrs from Big Bay Hut to the Pyke. The upper Pyke river is a scenic highlight of the trip. Incredibly deep pools, crystal clear water and few rapids make it a sublime float. There are still plenty of logs to watch out for though. The gorgeous water clarity ends at Lake Wilmot, which is very silty. Downstream of Wilmot, there is a section of Didymo infested water, which is very upsetting. Olivine Hut (6 bunks, standard, matresses, bunks, stove) is just visible from the river, as is the cable way. Immediately downstream of the Olivine confluence, there is usually a gravel beach. From the downstream end of the beach, search for a very obvious informal track, where you can carry your boats up to the track and easily onwards to the hut. 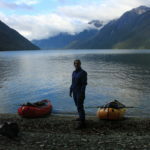 About 3-4hrs paddling to Olivine Hut. 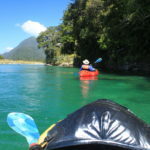 The paddle down the middle Pyke is much the same as the Hollyford. Some small class I-II rapids, lots of trees and lots of floating. Lake Alabaster isn’t as big as McKerrow, but you wouldn’t want to be out there in significant wind. The prevailing sea breeze is likely to be at your back though. Lake Alabaster Hut (26 bunks, serviced, heating) can just be seen from the lake, though there aren’t any signs at the lake edge. Its behind a reasonably obvious gravel beach at the southern end of the Lake. About 4 hours in calm conditions from Olivine to Alabaster Hut. If you are planning to head the extra 3.5hrs to Hidden Falls Hut today, then you can continue paddling down river. There are a few take outs along the way, but the most obvious is just downstream of Pyke lodge. 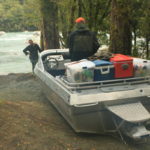 The further you go down stream, the higher the chance of missing a take out and having to do a bit of bush bashing to find the Hollyford track. The Hollyford track is a very well graded highway compared to the other walking so far. 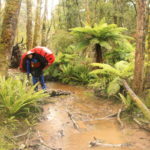 Its almost a ‘clean boot’ walk to Hidden Falls Hut, via Little Homer Saddle (3hrs 30mins). From Hidden Falls (worth the short detour) its another 2 hours or so to the road end. Visual. There’s epic floods in these valleys, so make sure you’ve got a non-epic forecast before heading out!